He trains my hands for war, so that my arms can bend a bow of bronze. 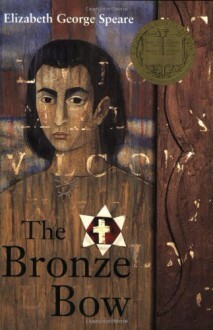 –from the Song of David (2 Samuel 22:35) The Bronze Bow, written by Elizabeth George Speare (author of The Witch of Blackbird Pond) won the Newbery Medal in 1962. This gripping, action-packed novel tells the story of eighteen-year-old Daniel bar Jamin—a fierce, hotheaded young man bent on revenging his father’s death by forcing the Romans from his land of Israel. Daniel’s palpable hatred for Romans wanes only when he starts to hear the gentle lessons of the traveling carpenter, Jesus of Nazareth. A fast-paced, suspenseful, vividly wrought tale of friendship, loyalty, the idea of home, community . . . and ultimately, as Jesus says to Daniel on page 224: “Can’t you see, Daniel, it is hate that is the enemy? Not men. Hate does not die with killing. It only springs up a hundredfold. The only thing stronger than hate is love.” A powerful, relevant read in turbulent times. The first 3/4 of the book was slow but it got better at the end. This was a read-aloud book for our family, and sparked many discussions about what life in the time of Christ might have been like. Very worthwhile reading, although not the best crafted writing. It won the Newbery Medal for excellence in children's literature in 1962.